Social entrepreneur, spiritual director, facilitator, leadership trainer, author, educator, mediator and master coach — in everything she does, Virginia Swain draws on her diverse background and experiences, including being a human resource manager at a Fortune 500 company, a marketing and public relations manager in both corporate and nonprofit organizations, 25 years as a consultant on five continents, as well as training and coaching emerging and seasoned leaders over 25 years at the United Nations in New York. Shortly after she was in New York during the World Trade Center attacks, she founded the Institute for Global Leadership to provide training and coaching for leaders and teams to adapt to the changed dynamics of our post-September 11th world. Together with her husband, Joseph Baratta, Ph.D., she was also the co-founder from 1993-2018 of the Center for Global Community and World Law, a non-governmental organization in consultative status at the United Nations. With international experience on five continents as varied as serving in the United States Peace Corps teaching in Africa and the United Nations community, Virginia Swain is the founder and director of the Institute for Global Leadership with expertise in global governance, the process by which humanity is evolving to political union. Virginia has served as a United Nations non-governmental organization representative and citizen diplomat since 1991. She gave seminars at both the Earth and Social Summits in Brazil and Denmark in addition to assisting in the preparations for the UN Beijing Women’s Summit, the United States Committee for the United Nations Habitat for Humanity Conference, and the 50th anniversary of the Universal Declaration of Human Rights. For four years, Virginia served on the Executive Committee of the Boston Coalition for a Strong United Nations and is the former co-chair of its International Business Task Force, which worked closely with former Secretary-General Boutros Boutros-Ghali to start the UN Global Compact. She highlights Culture of Peace and global citizenship to others in her television show, “Imagine Worcester and the World,” which debuted in 2007. View a segment with the presentation of Institute for Global Leadership Life Leadership Service Awards in 2013 and an interview of Virginia by Dr. Joseph Baratta. Listen to a podcast interview on the connection between inner peace and world peace with Angelo John Lewis of the Diversity and Spirituality Network. She has written two memoirs, A Mantle of Roses: A Woman’s Journey Home to Peace (Xlibris, 2004), and My Soul’s Journey to Redefine Leadership: A New Phoenix Rises from the Ashes of 9/11 (Xlibris, 2017) and maintains a blog at VirginiaSwain.com/blog. 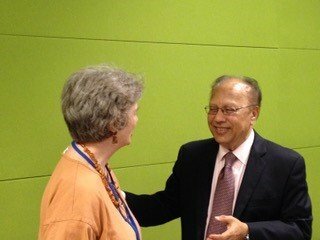 Pictured below with Virginia Swain is Ambassador Anwarul K. Chowdhury, former Under-Secretary-General and High Representative of the United Nations. Ambassador Chowdhury provided support at the United Nations for the Institute courses and programs, dedicating them to the International Decade for a Culture of Peace and Nonviolence for the Children of the World (2001-2010) and The Global Movement for a Culture of Peace (GMCoP) Ambassador Chowdhury wrote the foreword for the new book, My Soul’s Journey to Redefine Leadership: A New Phoenix Rises from the Ashes of 9/11 (Xlibris 2017). For bringing intercultural understanding to Worcester, Massachusetts, and to the United Nations, Virginia was awarded the Returned Peace Corps Volunteer Third Goal Service Award. She has been funded by various foundations to support her leadership and peacebuilding work in the Philippines, with Rwandans and former Yugoslavians, her participation in the Hague Appeal for Peace, the UN NGO Millennium Forum, and lobbying states for peace and disarmament issues. She has been active in the United Nations Global Compact and the Academic Council for the United Nations, and has presented at conferences such as State of the World Forum, International Educators for Peace, the Comparative International Education Society, Global Education Associates, Global Structures Conference, and the United Nations Development Programme. Virginia is committed to gathering and mobilizing like-minded people in a shared vision for sustainable peace and development. In recent years, her research and practice interest has included Security Council Resolution 1325: Women and Peace and Security, the Sudan Track II Peace Process and the Coalition for the Human Right to Peace. Learn more about this work in an interview on Imagine Worcester and the World.”, the television show Virginia created. Since 1999, she has trained Reconciliation Leaders for a Global Mediation and Reconciliation Service. Reconciliation Leaders, the leadership that delivers interventions in the Reconciliation Service model, begins with the leader’s personal mission as a foundation upon which to learn four levels of competencies. Leaders are provided with a toolbox to facilitate reconciliation interventions in community, organizational, national and global settings. An adjunct faculty member at Clark University, Baypath College, Quinsigamond Community College, Lesley University and Salve Regina University, Virginia has taught courses on career development, leadership, cross-cultural conflict transformation, change management, and managing in a global economy, and developed a customized leadership curriculum, Reconciliation Leadership, implemented in the United Nations. Virginia earned an organization development master’s degree from Lesley University in Community Building in Organizations and has advanced certifications from the Academy for Leaders, the Summer Peacebuilding Institute at Eastern Mennonite University in Ethnic Identity Consultation, Skills for the Religious Peacebuilder, and Consulting in Conflict Transformation and Reconciliation. She also holds certificates in leadership agility, professional holistic counseling, mediation, spiritual direction, Reiki Advanced Energy Healing, Myers-Briggs team building, and parent effectiveness coaching. 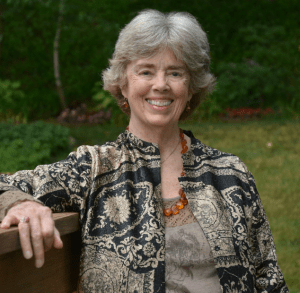 As an interfaith marriage officiant, Virginia prepares couples for marriage. Virginia is a member through the Institute of the Academy for Leaders and American Counseling Association, and the Institute is a member of the United Nations Global Compact, National Coalition of Dialogue and Deliberation, Spiritual Directors International, Transcend Network of Invited Peace Scholars and Practitioners, and the United Nations Association of America. Virginia Swain interviews Dr. Abu-Nimer on Imagine Worcester and the World television program.